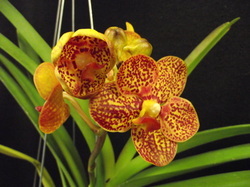 The Windsor Orchid Society meets each month from September through May. Meetings are held on the last Sunday of each month (except in Sept., Oct. & Feb. due to our participation in Orchid Shows). For these months the meetings are the 3rd Sunday of the month. Visitors and guests are always welcome. Location: St. Clair College, Room 192A (next to greenhouse on north side of building) and parking in Lot "L" gives ready access to the meeting room (access through Lot "M"). See map link highlighted in red. 2017 Speaker Topic Plant Sales?